The goal is to keep the groove above all else. Also to listen, as well as play musically… Listening is key, The drums drive the band, but the band steers the drums… Always be mindful of your mistakes, but let them blow away with the breeze… Think ahead, not behind… Stay in the moment, but don’t let that moment take you away… Laser focus, and a relaxed grip on the sticks… This is my world, the world of a drummer. Everyday. 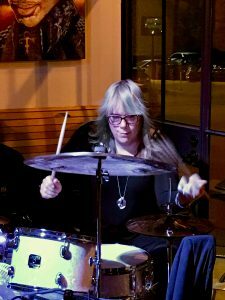 For more than three decades Danielle has been in constant pursuit of the groove. It began back when she was about 8 years old, beating on cardboard boxes with her first pair of sticks, and over thirty years later things haven’t really changed that much. Danielle attended Eastern Kentucky University, where she studied under renowned percussionist, Dr. Rob James. It was at this time that she began to branch out and discover the many other dimensions of drums and percussion including jazz, funk, latin and world percussion. A well seasoned member of the Lexington KY music scene, Danielle has played in countless bands and projects over the years. Two current bands of note would have to be The Baja Yetis and Metric Soul. The Baja Yetis have been funking up clubs around Kentucky for over 8 years now, and their jazzy, funky grooves are seasoned with a taste of New Orleans swagger. The Baja Yetis’ diverse original songs, mixed with deep improvisation and fresh arrangements make them a staple of many area festivals. Metric Soul is a newer project, but has shot into the limelight by debuting with their first EP on Nitrosonic Music LLC. Metric Soul was born into the festival scene and has since began playing clubs. Metric Soul is currently spending their time preparing and scheduling for festivals and concerts for the 2019 season, they are working on their first full album label release for 2019. Always on the move, Danielle has since branched out into session recording, and is currently the first call, go-to girl for Nitrosonic Studios. Wanting experience on both sides of the control room glass, she began to focus and hone her engineering and production skills, and is now assistant manager and second engineer at the studio. “I used to think I was pretty good at tuning… Then I bought a DrumDial! The DrumDial simply cannot be beat for ease of use, accuracy, and for tuning your drums without needing to make any noise. It truly is a must-have tool if you are serious about your drumming and need a no nonsense, precise tuning solution. Regardless of how loud the room is. Never have my drums resonated so cleanly and clearly as they do now. Having exact tension matching around the rim is so important to having a drum that is in tune with itself, it can be amazing how much proper tuning can “open up” your drum sound. DrumDial is so easy to use, that you will feel more free to experiment with different tunings. I know I have. This leads you to realize you can quickly and easily retune you’re entire drum kit on the fly… For any situation. I have several different tensions written down, that I use for various styles and sounds. I also have tunings based on the size of the room, and even for situations without proper mic’ing. In other words, with DrumDial, I am ready for any situation, and know I will sound my best. SledgePad by SledgePad Innovations LLC.